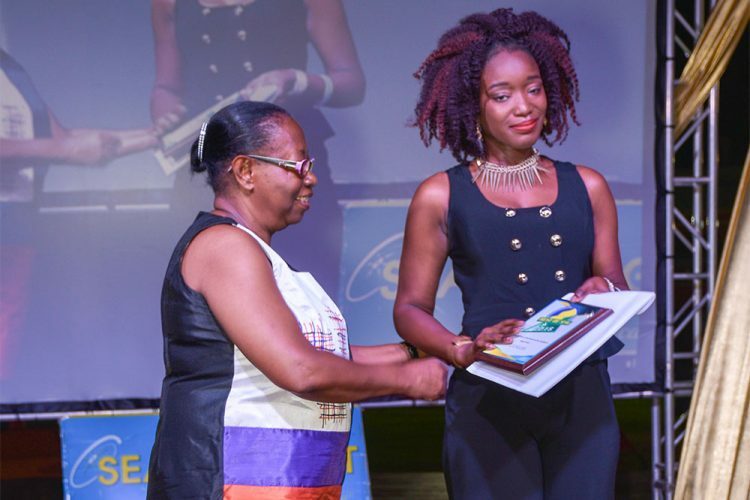 Nikita John, Best Vlogger in the 2018 Best of SVG awards (right) receiving her award from Corletha Ollivierre, Chairman of Interactive Media Ltd. When Nikita John started her YouTube channel four years ago, her fear of being criticised by her fellow Vincentians made her hope that none of them would watch her videos. But four years later, Vincentians enjoy her content so much, that they voted her Best Vlogger in the 2018 Interactive Media’s Best of SVG awards. John’s channel was started initially as an outlet for her to document her relaxed hair journey. But as the years went by, and the Carapan resident transitioned to having natural hair, she started making other types of videos. When persons visit her channel, GrowWithNiki Gaga, they can find skits, challenges and tag videos, hair videos, collaboration videos with other YouTubers and motivational videos from her series, Super Soul Sundays. The 27-year-old’s YouTube handle was initially an ode to her hair growth journey. But much like the content of her videos, the name has transitioned as well to mean “grow with me; spiritually, financially, physically, emotionally – all areas of my life”. And being on YouTube alone, has helped John grow in some aspects of her life. “I am more open when speaking to people. I know a bit more about St Vincent. When I first started, I hardly knew anything but because of what I do, I had to do a lot of research. For example, if I’m doing an educational video about St Vincent, I have to do my research. I learnt a lot more from that. I also learned to edit my videos, I learned a lot about the software, the lighting and all that good stuff that comes with it and I’m really enjoying it,” she said. The Vincentian YouTuber, who has 2,735 subscribers, also said that it opens up opportunities, more specifically in terms of collaborating with local businesses. While vlogging is a hobby for John, she revealed that she has been able to make money from creating video content. She also recommends making videos for YouTube to anyone who may be interested. After being voted Best Vlogger this year, John said that more people are seeing and recognizing her. She also revealed that it may have helped to increase her subscription after the award show in May. And she said that she feels really appreciative of the award. She is also pleased that other Vincentian YouTubers were recognized in the voting process as well because “some people are still not aware that there are Vincentian YouTubers”. Currently, the vlogger is participating in the worldwide YouTube trend of ‘Vlogmas’, where she uploads a vlog everyday in December as a way of sharing what she does during the Christmas season. She also said that she is “always thinking of ideas, ideas are always coming so I always have something to share”. John uploads three times a week — on Sundays, Tuesdays and Thursdays and she can also be found on Instagram; Growwithniki and twitter, Missnikigaga. The next Best of SVG campaign will be in 2020.